Our project is in the “Foundational Advance” track and similarly we wanted High School students to learn and investigate what Synthetic Biology is, and where it is heading in the future. 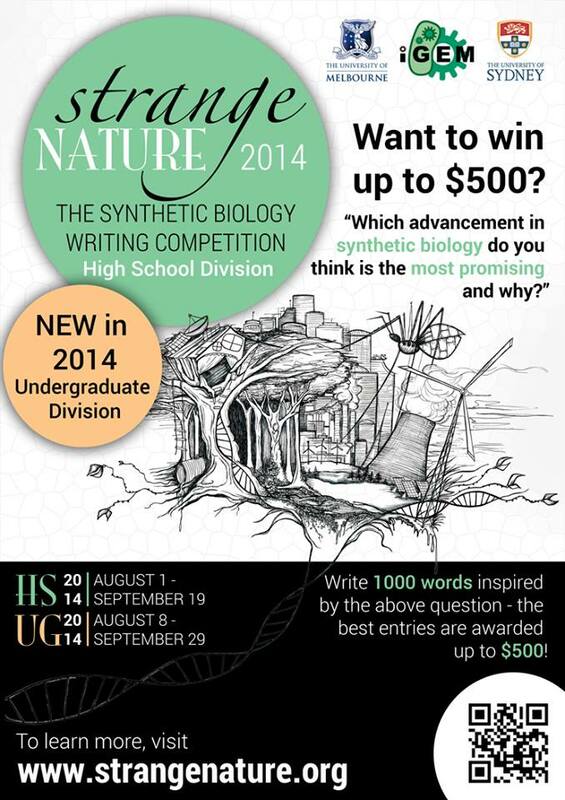 In 2013, the University of Sydney iGEM team created Strange Nature, a Synthetic Biology writing competition for high school students, asking the question "What problems will be caused or solved by synthetic biology?". We provided students with inspiration through our online learning platform, giving them a multitude of examples of the cool and kooky ways that synthetic biology can be used. While genetic engineering is superficially covered in the NSW and Australian High School curriculum we felt it important to try and get students to think beyond what they've been taught in class. Our aim was to encourage students to find information on Synthetic Biology on their own, and to raise awareness of the field. Our competition was hosted on the Strange Nature website where we provided resources about what Synthetic Biology was, recent developments and future applications. The competition was open until the 1st October. We had a whole host of submissions from Dystopian future stories of genetically engineered super humans to exploding E. coli. We had more essays submitted this year than previously and while the quality of submissions varied they were all incredibly insightful to what the students think about the possibilities of Synthetic Biology. We currently have a short list of 6 pieces which we feel are well written, explore Synthetic Biology and show imagination in their responses. 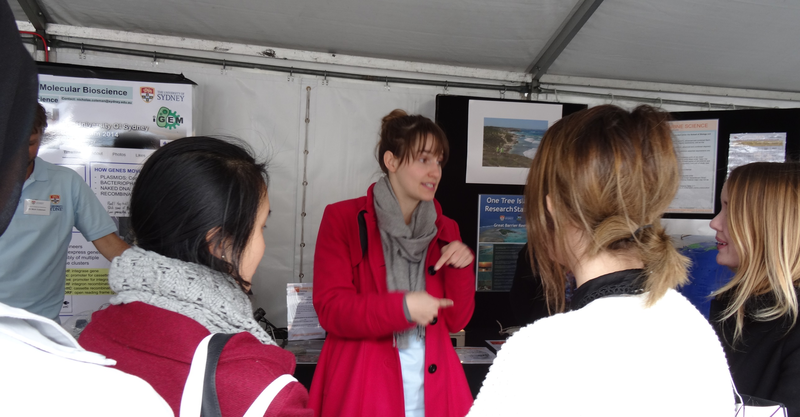 Over the course of the year we volunteered at our Universities Open Days, spruiking both studying Science and participating in the Strange Nature writing competition. Talking to future science students about what is possible and what may soon be possible was incredibly insightful and seeing their interest in Synthetic Biology was wonderful. Pictured above are Kya (left) and Callum (right) talking to prospective Science students about everything from Genetic Engineering to the best place for coffee on campus. We also volunteered as part of the Australian Society for Microbiology during Science Week at their stall at the Australian Museum. There we were able to talk to hundreds of Primary (years K-6), High School students (years 7-12), and general members of the public to discuss Microbiology, Biotechnology and also find out what they knew about Synthetic Biology and genetic engineering. 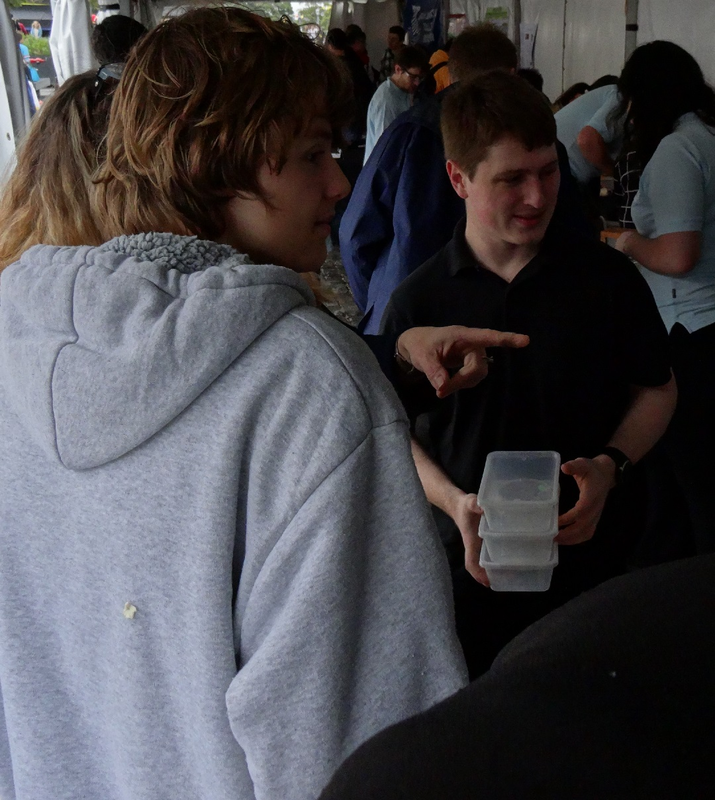 The displays really fascinated the kids and students, especially the fluorescent bacteria! We got in contact with many teachers and schools to promote the writing competition. We also wrote articles for Science Resource Newsletters sent to teachers to try and increase the awareness of our project. In preparation for promoting the competition, we contacted the University of Melbourne iGEM team to see if they would like to collaborate. As part of their outreach, they decided to create their own informative video about Synthetic Biology for high school students, including a one minute feature about Strange Nature! In total, 32 entries were received from all around Australia, ranging from as young as grade 8, up to year 12 students. The best pieces we received demonstrated they had done some research into what Synthetic Biology actually is and the possibilities this new field can bring. The vast majority of submissions we received were incredibly positive about the technology and in many submissions the level of excitement conveyed was incredibly encouraging. To go beyond simply giving a prize for the "best" piece we are providing feedback for each submission to correct some mistakes and also to start a discussion on their topics. We believe that this would help to create a healthy dialogue between interested members of the public, and the research scientists behind the technologies. Many pieces only considered the positive side of an advance, such as in vitro meat, while not addressing the negative problems. Our aim was to encourage students to consider the future of Synthetic Biology and through their submission and the feedback we provide it is our belief that we are prompting them to broaden their thinking of the advances which may come in the future. To see some of the submissions we received, pick a title below!